This section looks at the history of the fishing lure and gives a definition of a lure. The modern lure is a mass produced plastic, wooden or metal creation with hooks attached. Traditional lures and feathered hooks have been manufactured by many people around the world. There is evidence that forms of fishing lures have been used throughout history however it is probably useful to look at a definition of a lure. ‘A fishing lure is a type of artificial bait which is designed to attract the attention of a fish. The lure uses movement, vibration, flash and colour to mimic what a fish may eat. Many lures are equipped with one or more hooks that will catch the fish when they strike the lure. Some lures are placed to attract fish so a spear can be used or the quarry be hand caught such as a decoy. Most lures are attached to the end of a fishing line and are used with a fishing rod and reel however there are techniques where handlining is used from boats or canoes’. The Hawaiians are renowned for their angling skills and were making hand made fishing lures throughout history to target the species that are abundant in the waters around the Hawaiian islands.The native Hawaiian people have a close affinity with the sea and are well known for having several different lures that were used for targeting fish in and around the many islands that make up Hawaii. The traditional native people of the Hawaiian Islands had a complex relationship with nature, the environment and the sea. The main source of meat based protein came from fish, shellfish, octopus and squid. The fish stocks were carefully managed by elders and a strict tribal structure where seasonal gathering of food was controlled. The Hawaiians practiced early aquaculture, stocking lagoons with future stocks of fish and creating artificial environments to trap, net and gather fish and seafood. 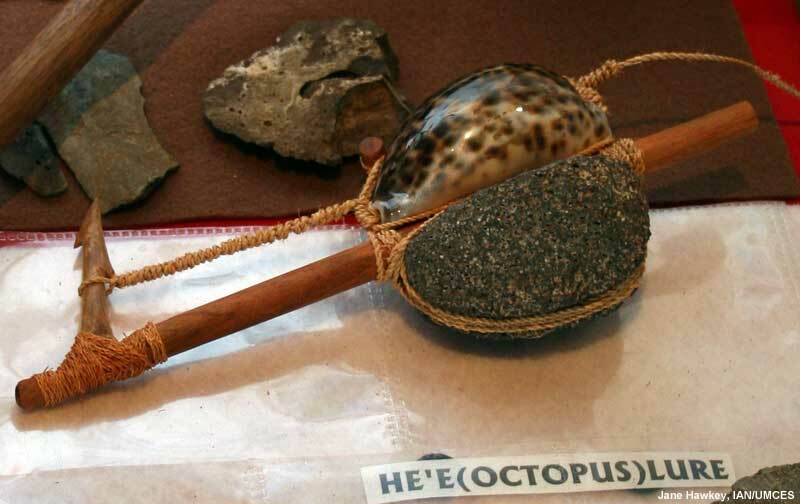 By the time Captain Cook arrived in Hawaii, there was a thousand years of history making fish hooks and composite hooks that also included lures. Above is shown two examples of Hawaiian bone trolling lures which would have been used for targeting pelagic species. The videos below illustrate how these lures were made and gives a good insight into Hawaiian fishing techniques including the importance of lure fishing. Right shows a fine example of a 'plummet sinkers' that were made to get the bait or lure into deeper water when fishing for octopus, a large bone fishing hook and a traditional octopus lure or jig. 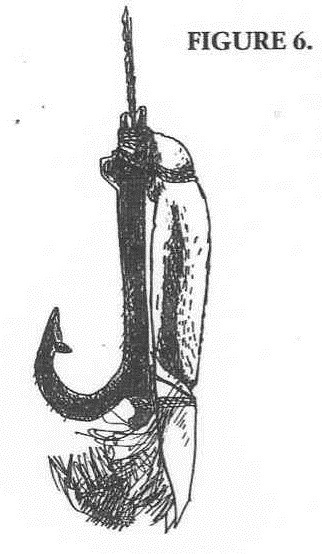 Another type of composite hooks held squid lure. Squid lure is a misnomer, because the lures were in reality used to catch he'e, or octopus. These lures used a cowry shell, with a stone sinker to attract the octopus. The first step involved smoking the cowry shell over a fire before it could be used as a lure. The successful he’e fisherman matched the stone sinker and the cowry shell with the color and time of day. The hook was fastened to a short stick sandwiched between the shell and the stone, and protruded about two inches from the lure. The octopus would be captured when it encircled the lure and then quickly retrieved to the canoe. 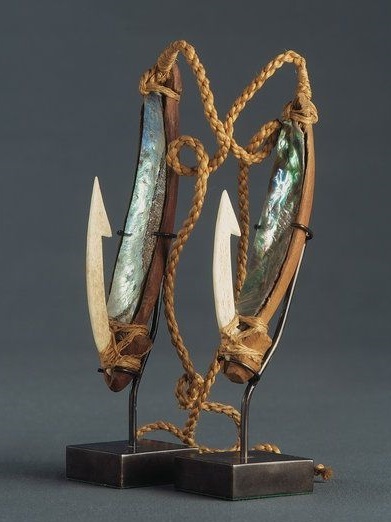 The Maori of New Zealand definitely made a form of fishing lure as shown. It was called a PA KAHAWAI which translates to 'Trolling Lure'. 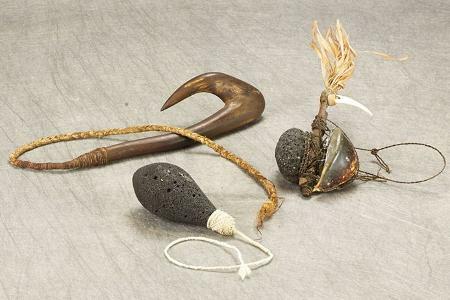 Similar to the Hawaiians there was significant ceremonial ritual around the attachment of the hand made cords and making of these items. They were made to last and a great amount of effort was invested in the gathering of the materials and manufacture of these fishing implements. Matau (fish hooks) made by Mäori are simple, ingenious, and beautifully constructed. 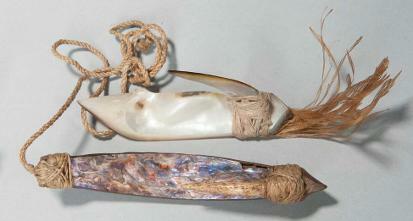 Pä kahawai are a trolling lure that was made with local materials including wood, shell, and bone. The fish are attracted to the flashes of movement and colour of the iridescent päua shell that line the shank. 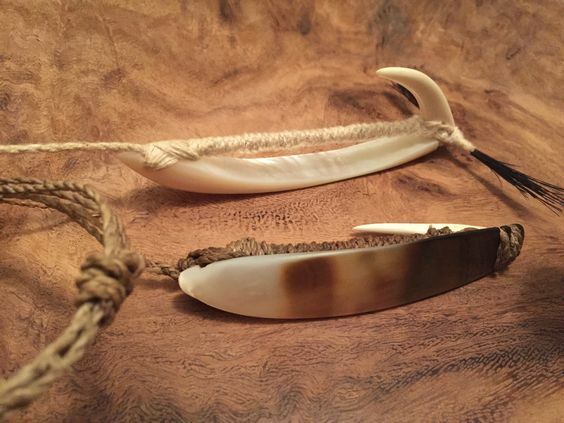 The shank could be made out of whalebone or wood. 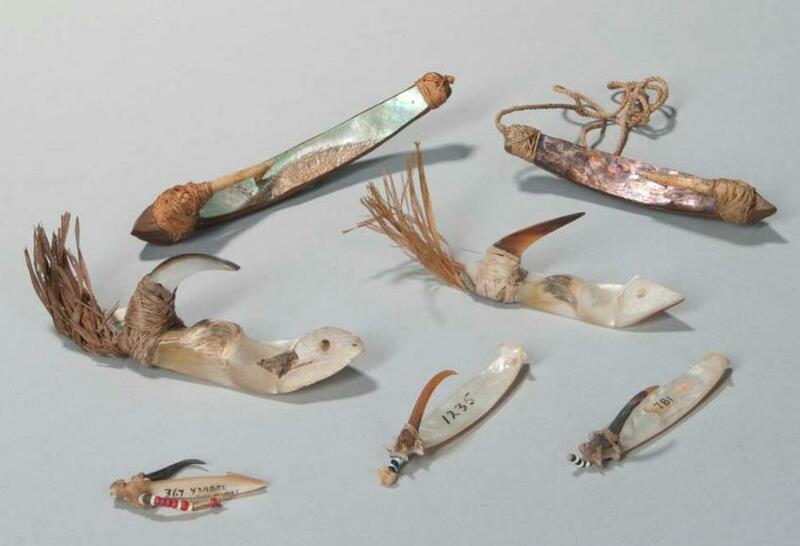 These primitive lures were sometimes decorated with feathers which added to the attraction and movement. These lures were trolled behind waka (canoes) in estuaries or close to coastlines using lines of finely plaited muka (flax fibre). 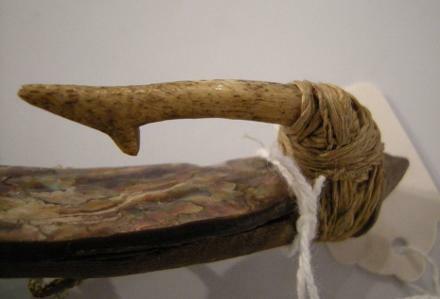 Large wooden fish hooks for bigger prey such as häpuku (groper) are made from strong wood such as tauhinu tree roots which were further hardened by fire and lashed with flax fibre. Polynesia includes the people of Hawaii and New Zealand but also Tonga, Samoa, Cook Islands, Tahiti and includes the Marquesas and Solomon Islands. All have a similar history when it comes to hand made fishing lures. Micronesia includes Nauru and the Caroline, Gilbert, Mariana and Marshall Islands where people also used similar fishing techniques. In fact it seems that all the native island inhabitants of the Pacific region (and this includes the Australian Aboriginals) used the same variations of flashy fishing hooks with elaborate knots that could be used from canoes or small boats. Shown here a small lot of Polynesian/Micronesian lures that went to auction several years ago at Skinners Auctions fetching a price of approximately $2500. This included a wide variety of styles utilising abalone shell, bone and the hand woven flax lines and adornments. 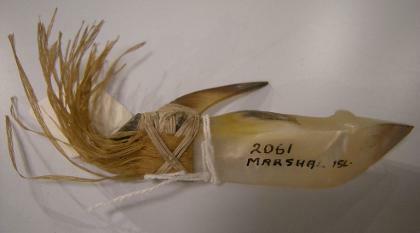 The lure below is specifically from the Marshall Islands. An interesting account of a lure made in the Tobias Island which utilises the Hibiscus fibre similar to the Hawaiians which used this fibre also.